Food Not Bombs co-founder Keith McHenry helped organize the meal, and he reports that many of FNB groups across the country would be sharing vegan meals on Christmas this year in response to an increased need due to new cuts in food stamps and an extreme reduction of access to food during the holiday season. McHenry awarded Santa Cruz volunteer Jeane the Five Carrot award for being one of the people dedicated to making sure the Saturday meal at the post office happens every week. 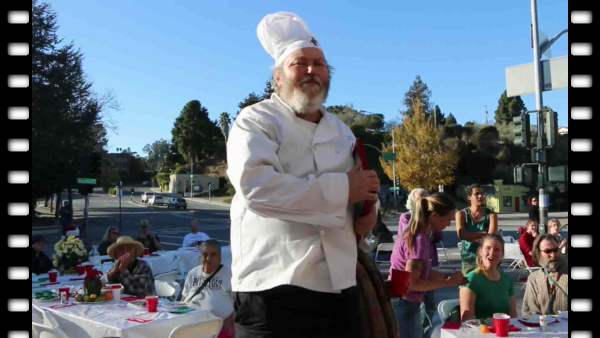 The post office has been the regular location for Santa Cruz Food Not Bombs weekly servings for over a year now on Saturdays, and McHenry announced that they could be expanding to serve free meals on Sunday as well. McHenry encouraged everyone to eat more and take food with them because they cooked for a thousand people.